In case you missed my post on Sunday, I announced that my Starburst pattern is going to be released on May 6! In conjunction with the release, The Brown Needle got a new name, new look and new blog! To celebrate, I'm giving away the first copy of my Starburst pattern to one lucky follower of my new blog. Click on over to Sewlio, follow through GFC, your favorite blog reader or e-mail and leave me a comment over there that you did! Big changes are coming soon for my little blog, and today, I'm spilling the beans. A little over two years ago, when I made my first quilt, I never dreamed that I would ever make more than one quilt, or two. A decision I made out of boredom, turned into an obsession which eventually turned into my favorite creative outlet. Over the past couple of years, I have been thrilled at the response to several of my quilts and humbled by the many requests I have received for patterns. Now, the first of those patterns, months in the making, are just a week away from being available! My blog has also undergone several changes over the past couple of years. I originally started my blog as a way to show my craft projects with my friends and family, never even considering that I would have "strangers" following my creative journey or that I would ever want to sell patterns or things that I have made. As I have considered how to write and publish patterns, I decided to consult a professional (my hubby), and together, we decided that a new "brand" was in order- Sewlio. And that leads me to the news about my blog. There. I said it. I've been putting it off for a while now, but it's time. My new blog is quite empty right now, but over the next week, I will be moving in. A lot of my content will be moved to my new blog and I'll be adding a lot of links back to posts at The Brown Needle. I will also be adding Etsy and Craftsy shops, more free tutorials (that many of you have requested) that are already finished and ready to go, and a few other extras. Now, for the party.... my moving party. I would be delighted if you all would move with me! 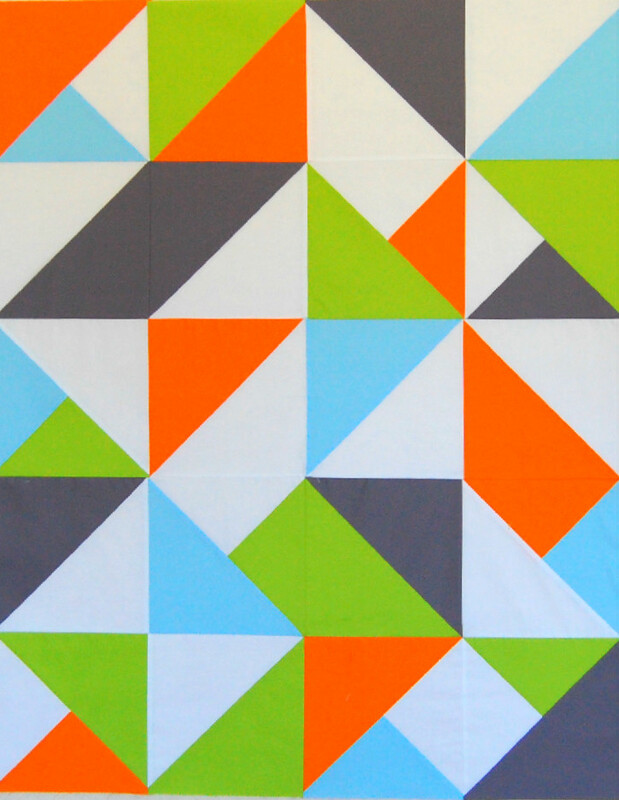 In honor of my big move, I'm giving away a PDF of my first Starburst pattern! All you have to do to enter the giveaway is click on over to www.sewliodesigns.com , become a follower of Sewlio and leave a comment over there letting me know that you did. Thank you all for all your support and kind words over the past couple of years. You all mean the world to me. I hope to see you at my new home! Some of my favorite things to make are baby quilts. And my favorite fabric? Well, I have really fallen in love with solids. This is a baby quilt top that I finished piecing this week while taking a break from pattern writing and testing. It was designed, totally by my hubby, and while he didn't intend the design to be used for a quilt, I couldn't see it being used any other way! I used Kona solids and half square triangles for this quilt. It measures 32x40. I'm still considering how I am going to quilt it. I love quilting in dense straight lines and concentric shapes, but I also think the large solid spaces could really show off some free-motion quilting. So let me ask... How would you quilt it? It is spring break here, and a busy one at that, but I did finally find time today to finish a quick project. My poor front door has been naked since Christmas. 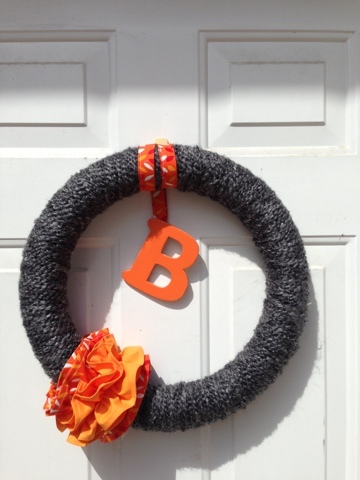 I think this orange and gray ruffled wreath is prefect for spring, even if the weather still says it's winter! I made this wreath with a foam wreath form that I wrapped heavily with gray yarn. For the ruffles, I chose an orange print fabric and a coordinating orange solid. I cut the print 6" wide by 42" long and the solid is 4" wide by 42" long. I put a 1/4" hem down both sides of each fabric strip, although I think cutting the strips with pinking shears, would be just as cute and much quicker. I sewed with a long stitch down the center of each strip and then gathered the strips. I gathered the print to go around the wreath 3 times, which was about 18" and the solid to go around the wreath twice, which was 12". I secured the back with safety pins just in case I because I will get tired of the orange and want to change it. I used a little of the print fabric to make a hanger for the wreath and to attach the letter. About the letter... when my kids saw me get out the paint, they thought that today was craft painting day... so my "quick" project quickly turned into an afternoon of paint and cleaning. It never seems to be a "quick" project when the kids are on spring break! When I first saw the Washi Dress pattern, I knew I wanted to make one! They are so cute, and summer is coming. One of my favorite parts about summer is all the casual dresses in my closet. I don't think you can beat a cotton dress for comfort and versatility. I think a little navy sweater would be adorable over this dress for spring. ﻿﻿The pattern pieces and instructions were super easy to follow. I would say that even a confident beginner could make this dress with ease. While the pattern doesn't include instructions for a lining, the website includes step-by-step video tutorials on how to make this dress with a lining. The videos are incredibly helpful easy to follow. I chose a sleeveless version of the dress. I used a mustard yellow cotton chevron print I picked up for a great price at a local quilt shop that was going out of business. While I didn't intend the fabric for this dress, I landed on it while browsing through my stash. It is a quilting cotton, but soft and I really thought it would drape well. I chose to make my dress with just a bodice lining instead of a full lining. and I used the same fabric for the bodice lining as I did for the dress. In retrospect, I would choose to line the whole dress instead of just the top. I really think it's necessary, especially with a lighter weight fabric. The back of this dress is shirred, so there is no need for a zipper (yay!) For me, that was really the draw to this pattern. If you haven't shirred fabric before, you definitely shouldn't let that deter you- it's fun and kind of magical. Really. A zipper is definitely a run-for-the-hills deterrent. The pattern gives thorough instructions for this. Piece of cake. I promise. If I were to make this dress again- and I will- I think I would leave out the keyhole in the neckline, make it a maxi dress and use a double gauze or voile. It definitely needs a much more drapey fabric. I do not have a stick figure and the pleating in the front provides me with curves in places that would make strangers ask when the baby is due.... Ahem. No, thank you, on the awkwardness. Since it is March- the end of the sunless season and, as my hubby puts it, have legs that look like I'm wearing white tights, I will spare you the blinding pictures of me wearing the dress. Maybe in August. Only maybe. Back in November, my Hubby found this beautiful mid-century modern quilt rack at an antique store. When he called me up and said he wanted to buy a "cool quilt rack", I was totally skeptical. I have honestly never found a quilt rack that I even kind of liked. I had been looking faithfully for an old ladder to use to display my quilts, but I hadn't been able find one in my price range. I gave in to the quilt rack's $30 price tag and I'm so glad I did! I think it looks naked without any quilts on it! Here's a photo with some of my current quilt inventory... Man, I have really got to let go of some of those quilts! What I didn't know at the time, was that at that same antique mall, he also found the ladder that he surprised me with for Christmas. With every bee block I make, I realize I want to make a whole quilt with them. This one is no exception! I am dying to see how all these blocks look once they are joined together. Of course, I love, love, love the Tula Pink fabric. I can't wait to see this quilt finished. I sew nearly every day. I love to sew. I love to quilt. I love to create. One thing I really struggle with is blogging my creations and the processes that I go through to make them. I like blogging, but I'd rather be sewing. In the past few months, I have really neglected my blog, but I have spent many hours writing and testing those patterns that you are all waiting so patiently for. In any case, I haven't neglected my sewing machine one bit! Part of that is due to my MAJOR sewing machine upgrade that happened in October. See.... I haven't even told you all about that! And that was HUGE! There might be more, but this is all I can remember right now. I'm going to get them all posted. This is the laptop bag that I made last week. I didn't use a pattern for this. I took measurements of my laptop, decided what shape I wanted the bag to be and just wend for it. I really like how it turned out. I have had the transistor fabric for a while. It was one of those things I bought because I really liked it, but had nothing in mind to use it for. I think that it is perfect for this bag. The bag has a layer of batting and some heavy weight interfacing. I also wanted it to have a separate pocket for other things, whether it be my cord, or in this case, a book, sketch pad and pencils. Figuring out how to place that divider was tricky, but I like a challenge, especially when it's finished! It's finished! Here is a quick photo of my finished Starburst quilt. Yes, I'm still working on the pattern. I felt like I learned something new with each block I made- so glad I decided to make a bigger quilt with them. I'm working at adding all that information to the pattern, and, of course, my wonderful hubby is making it all pretty. I can honestly say I'm learning a lot in this pattern writing process. I'm enjoying it, but I'll be very glad when it's done! I'm ready to move on! Today I'm binding my Starburst quilt. After a (hopefully) minor back injury and a sick child, we were blessed with two snow days. I was finally able to get the quilting finished this morning while the kids were making a mess snow fort in the front yard. All that stippling took forever! I'm chose scrappy binding because it's my favorite and because it works with this quilt. I worked out a few kinks in the pattern and added a lot of tips. Things are really starting to come together and I'm getting a teensy bit excited.